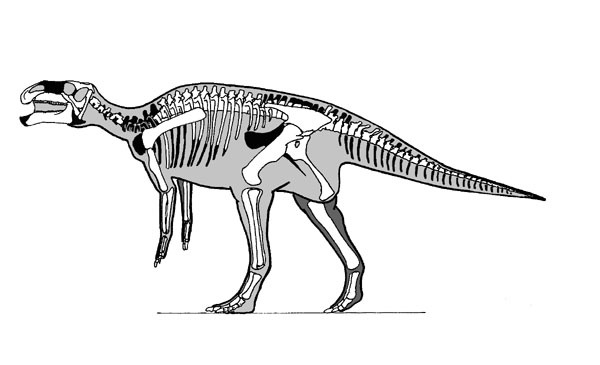 Etymology: “Before Bactrosaurus”, The name indicated the possibility that this genus may have been an ancestor of the later Bactrosaurus. Locality: Alashan, Maortu, Zizhiqu, Inner Mongolia (Nei Mongolia), China. Age: Aptian-Albian Stage, Middle Gallic Subepoch, Upper Early Cretaceous Epoch, Early Cretaceous. Material: Mounted partial skeleton, quadrapedal pose. 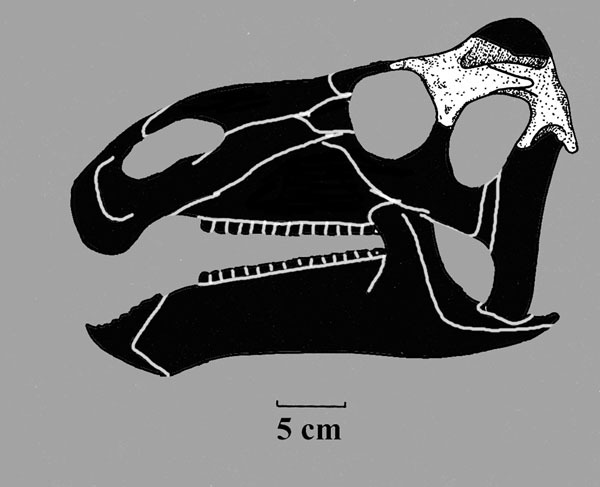 PIN 2232/1-2: Partial skull roof, premaxilla. PIN 2232/1-4: Axial; 7 poorly preserved cervical vertebrae, 6 dorsals, 4 sacrals, 22 caudals; Appendicular; right and left scapulae, left coracoid, right and part of left humerus, right and left ulna, right radius, metacarpals II? III? IV, V? left femur, left tibia, left and right fibula, and left metatarsals II-IV. 2 incomplete skeletons, a few articulated parts of a skeleton (limbs and girdle) and a large number of scattered bones from the Maortu site 60 km north of lake Dzhilantay. PIN 2232/2-2 : Partial left dentary. PIN 2232/9-2: Partial left maxilla. PIN 2232/10: Mounted partial skeleton, bipedial pose). PIN 2232/10-2: Right dentary, partial skull roof, maxilla, 6 cervicals, 18 dorsals, 7 sacrals, 24 caudals, left and right scapula, right coracoid, left sternal, left and right humerus, left and right radius, left and right ulna, manus, left and right ilium, left and right ischium, actebular fragments of pubis, left and right femur, left and right tibia, left and right fibula, metatarsals II-IV (left and right), phalanges (Left pes: IIi, Iliii; IIVi-Vi; right pes; IIIi-iv, Ivi-v). PIN 2232/10-69: Manus phalanx? Vii or Viii. PIN 2232/11-2: Manus phalanx IIIiii, Il-4, pollex ungual; II-5 ungual manus II. PIN 2232/18-1: Partial left dentary. PIN 2232/18-8: Phalanx manus Iii. PIN 2232/23-2: 2 isolated dentary teeth with roots. PIN 2232/24-1: Worn dentary tooth. PIN 2232/3? : Left dentary with teeth. Field no. 12017 (Pin 2232/2-): Metacarpals, and left ilium. Field number 12068: Metacarpal II. Locality: Alashan, Maortu, Inner Mongolia (Nei Mongolia), Zizhiqu, China. 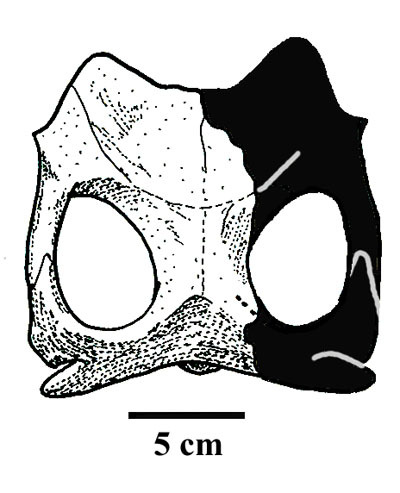 Material: Posterior part of skull. PIN 2232/41-4: Fragmentary left humerus. PIN 2232/40-5, 40-6: Left metatarsal block, II, III. Jaws, vertebrae, limb bones and their girdles belong to several individuals. Locality: Gongpoquan Basin, Mazongshan, county of Subei, Gansu (Kansu) Province, China. 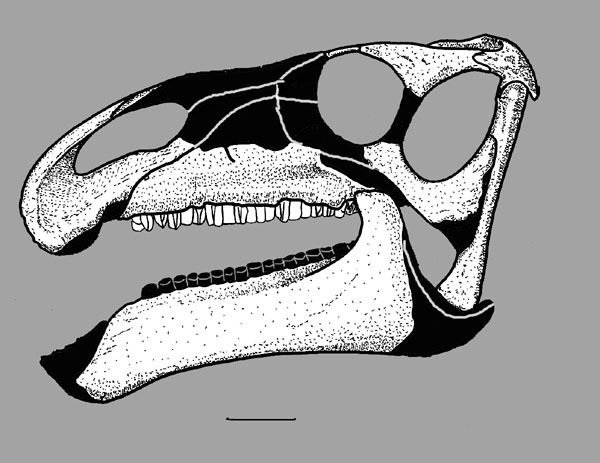 Material: Posterior part of an incomplete skull. IVPP V. 11334-1: 4 cervical vertebrae, including one nearly complete tenth cervical vertebra. 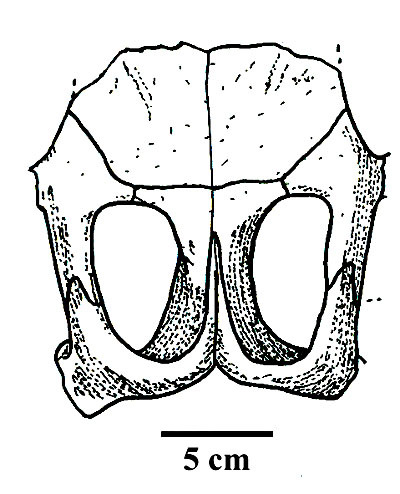 IVPP V. 11334-2: Second dorsal vertebra. IVPP V. 11334-3: Nearly complete sacrum. IVPP V. 11334-4: 2 series of caudal vertebrae, some with spines and haemal arches. IVPP V. 11334-5: A right femur missing the proximal part. IVPP V. 11334-6, 7: Parts of the right and left pubis. IVPP V. 11334-8: A part of the anterior process of the left ilium. IVPP V. 11334-9: The posterior part of a right ilium. IVPP V. 11334-10, 11: 2 nearly complete maxillary teeth. IVPP V. 11334-12, 13, 14, 15: 4 dentary teeth. IVPP V. 11334-16: Part of the left quadrate. IVPP V. 11334-17: Complete left scapula. IVPP V. 11334-18: Part of the left humerus.